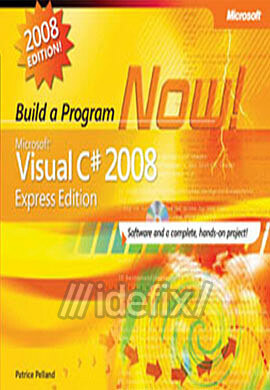 Title Microsoft Visual C# 2008 Express Edition: Build a Program Now! In this lively, eye-opening, hands-on book, all you need is a computer and the desire to learn how to program with Microsoft Visual C# 2008 Express Edition. Featuring a full edition of the software, this fun and highly visual guide walks you through a complete programming project a desktop weather-reporting application from start to finish. You ll get an introduction to the Microsoft Visual Studio development environment and learn how to put the lightweight, easy-to-use tools in Visual C# Express Edition to work right away creating, compiling, testing, and delivering your first ready-to-use program. You ll get expert tips, coaching, and visual examples at each step of the way, along with pointers to additional learning resources. Patrice Pelland is a development lead at Microsoft with more than a dozen years of experience designing software. He is also an experienced mentor and an instructor of programmers at all skill levels. Patrice is the author of previous editions of this popular title: Microsoft Visual C# 2005 Express Edition: Build a Program Now! and Microsoft Visual Basic 2005 Express Edition: Build a Program Now!